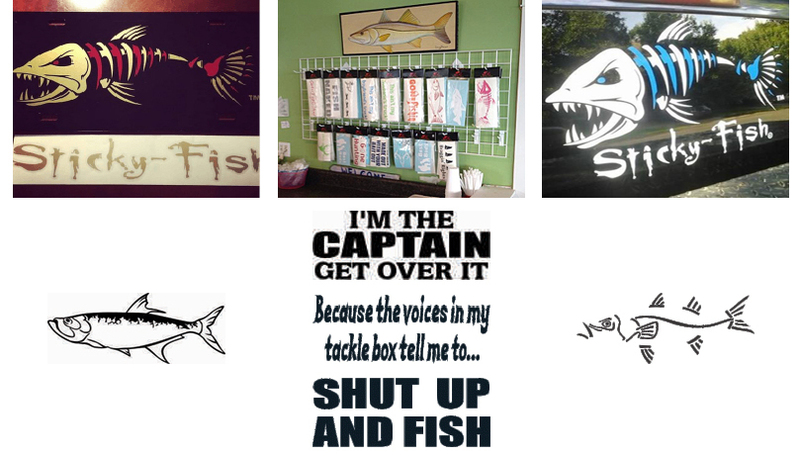 Saltwater Fishing Decals & Vinyl Stickers for Boats, Trucks, Kayaks and Custom Brand: Most known for their aggressive fish skeleton decal, their products can be seen on the back window, cooler or boat of top anglers nationwide. The official decal company of Boca Coast, Sticky-Fish offers high quality decals for sale wherever fishing tackle can be found and online via the link above. They have license plates and catch phrases that allow you to express and display your passion for fishing. Let everyone know you're the captain with the addition of their ghost snook, tarpon and redfish decals to the back window of your truck. We contacted the folks over at Sticky-Fish after seeing their decals on our friend's boats and cars alongside Salt Life and G. Loomis (fear no fish) stickers. Everyone seems to love dressing up their tow vehicle and their Yeti coolers with these custom designed logos. They proudly display their passion for the outdoors and fishing, while spreading awareness of the brand. This was something we had to get in on. But it wasn't just seeing that they were so popular, the fact that they were 100% made in the USA, or even that they were in all the bait shops. For us it was the fact that their decals were placed on everything from windows to jet skis for years and they still looked good as new. We've had friends put them on their kayak or coolers and they literally outlast what they're adhered to. The bottom line was that we wanted the best manufacturer of custom vinyl decals to produce something that represented our company and brand of bait fish chum. We have shipped out several Boca Coast two color vinyl decals to our page fans and the quality is recognized immediately. Fishermen know when they have a great product and are sure to tell their friends: Sticky-Fish decals deliver the fun and catchy decals they've been looking for!